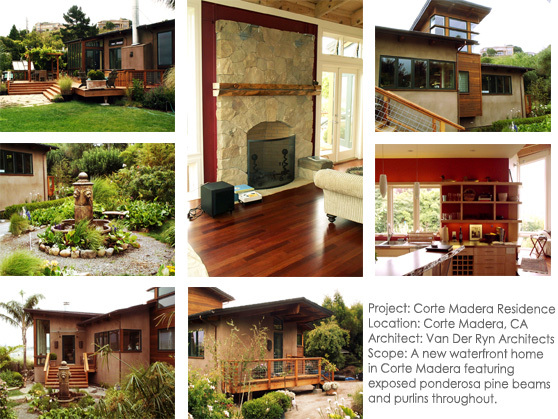 This extensive remodeling project located in Corte Madera, on the shore of Paradise Cove involved generous daylighting and features exposed Ponderosa Pine beams and purlins throughout. The house sits on a hill overlooking San Francisco Bay and Mt. Tamalpais. The owner asked the Ecological Design Institute to design a that integrates energy and materials conservation, land stewardship, and regenerative living systems. Through careful siting and the use of sustainable materials, the Corte Madera residence minimizes environmental impacts and energy consumption. Highly insulated roofs slope to the north, while windows along the south allow the sun both to heat and light most rooms through out the day. The rammed earth exterior walls acts as insulators, keeping hot or cool weather out. Interior rammed earth walls store the sun’s heat and re-radiate it to the house during the night, adding warmth as well as texture and beauty to the home. Heating demands are further reduced through the use of solar panels. Household water is recycled through an engineered wetland and reused for irrigation.